Want your projects to be catchy and memorable? Then try this cartoon vector clipart to bring fun to your works, and make people interested in them. By the way, the extended license of this product allows to use it for whatever projects you need: both personal and commercial. 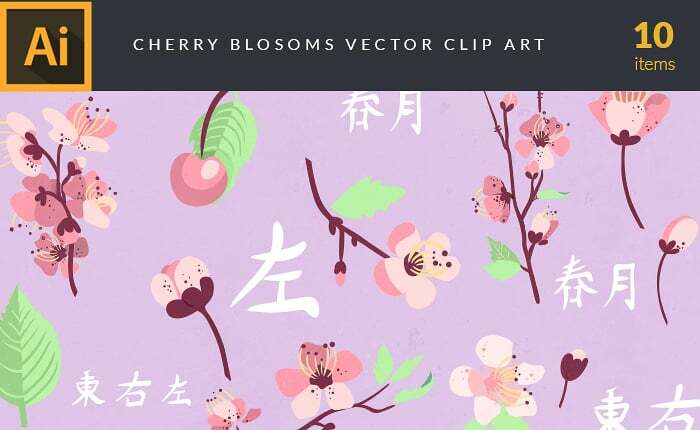 Within this bundle, you get 402 ready-made vector clip art items. It is subdivided into 27 sets according to categories: music, laundry, insects, herbs and spices, exotic fruits, drinks, decorative trees, cutlery, colorful feathers, cinema, cherry blossoms, birds, birds, baby shower, wedding doodles, babies, travel, sushi, stationery, ribbons, puppies and others. As you can see, the choice is good enough to find what you really need. 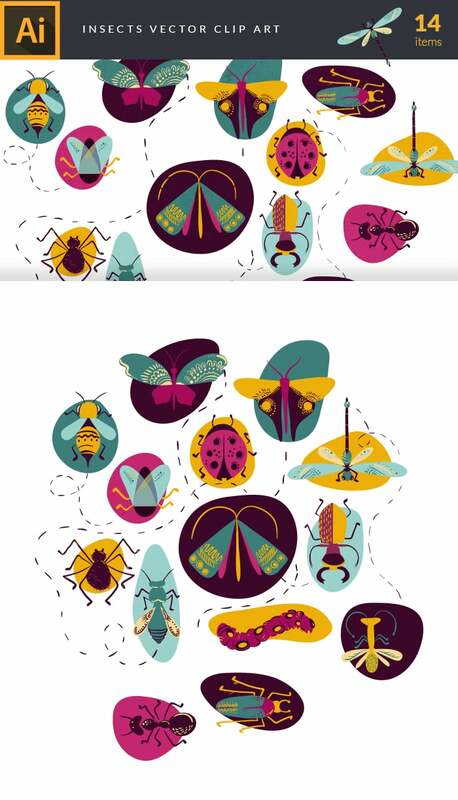 All vectors are pre-drawn, pre-colored, pre-set, in other words, they are pre-cooked for your comfortable use. You are free to modify them, add the desired changes and get the result you need. Everything is simple and will not take you extra skills. Whether you work with presentations, draw cartoons, illustrate books for kids, this bundle will come in handy for you. Don’t miss a chance to get it for $10. Do you often find yourself in a tight schedule? Lack of inspiration, maybe? And clients pressuring you into doing tremendous amount of work with no extra compensation? Well, we see you and we understand what you’re going through. That is why we’ve come up with a clever solution to save you time, effort and a headache! 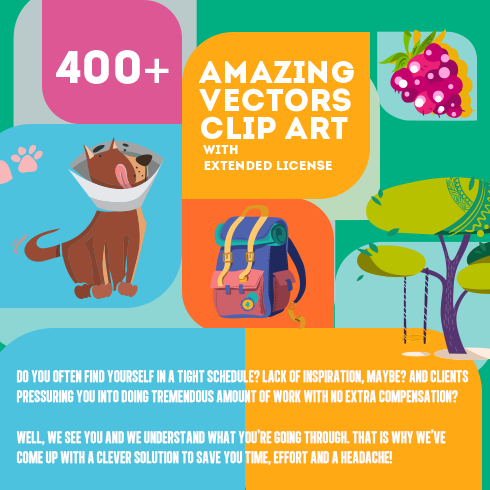 Pre-drawn, pre-set, pre-colored and pre-cooked, this bundle containing no less than 402 vector clip art is ready and willing to serve your purposes. You’ll get 27 sets from different categories such as: Babies, Puppies, Desserts, Flowers, Wedding or Travel. Whether you’ll use them to quickly complete projects, create templates, in slideshows or you simply want to devise an evil plan to take over the world, that is up to you! 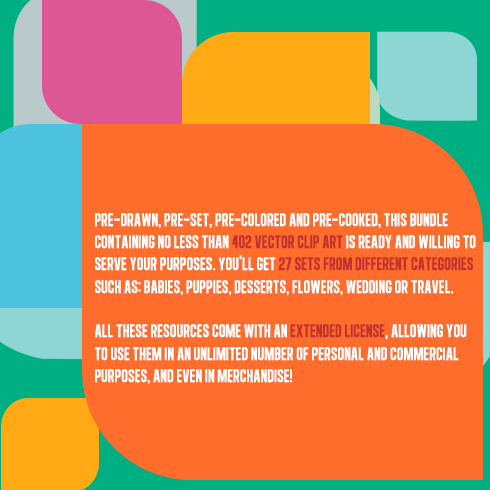 All these resources come with an extended license, allowing you to use them in an unlimited number of personal and commercial purposes, and even in merchandise! The bottom line is, whatever you’re going to do, you’re going to need some minions to do the heavy lifting for you. But slavery is prohibited nowadays, so this pack is both morally correct and useful at the same time. And at a price as low as $19, this is definitely a must-have! Just about every single designer, as a talented professional, absolutely should be able to sketch any image from the begining. Only it is going to take too much effort and time and will never provide sufficient financial gain for him or her. For this reason the vast majority of designers make use of pre-made visual elements – combine these graphic components, modify them and put together the design . It is ineffective to purchase these components on an individual basis, so that is the reason why they are put into graphic bundles and marketed as a single product. The way to spend a lesser amount of money on MasterBundles products? Yeah, I am aware they are already cheap, but there is still place for saving. Share this web page via social websites – you automatically get the 5% discount for every of the graphic packages you prefer. That is a super easy way to get a professionally designed tools for less money. The pros of graphic deals for designers are pretty obvious. But if you are new to them and now have doubts, the subsequent information is going to be of great help for you. Along with a great number of the elements within a single package, the collection provides you with a chance to use different of them for a number of projects. Besides, the cost is typically cut down tremendously which lets you save some dollars, yet get the complete set priced at hundreds of dollars. Since each of the package deals differ from one to another, each individual graphic designer will discover the appropriate selection for a unique project. Checking them you will uncover the collections including illustration swatches, social media infographics, UI kits, business cards, plus much more. At MasterBundles.com marketplace, you’ll find over 450 graphic bundles to choose from. That being said, you’ll not have even a chance to get away from the website without a bundle or two. Aside from graphic design deals, you may find a vast range of other collections on MasterBundles. The packages of logo templates, icons, patterns and fonts are readily available for your use. On top of that, you may find the entire bundles of WP templates, courses and e-books, cv templates, slides, and other components. Content on blogs which include infographics tend to be more readable and trendy than those that don’t. Infographics are a fairly popular design product each and every designer must be qualified to build. A special bundle for infographics is handy because it offers a ready-made solution. The web designer has only to blend the pictures and there you are! The infographic is all set. Living in the digital and online era, all of us commit literally half of our everyday life within social platforms such as Instagram. No matter what purpose we strive to reach by using this platform, we wish to stick out in a giant crowd amidst a large number of identical profiles. Luckily, with top quality Instagram design templates sold at MasterBundles, it’s not necessary to spend eternity while creating the outstanding look of your page. One of many bundles will surely let you emphasize the artistic appearance of your Instagram page. A different bundle additionally well suited for professional photographers as well is assigned to photo deals. On MasterBundles you will discover loads of products for photo treatment. If you want Lightroom presets, PS actions, photo overlays, or other resources for working with photographs, you’ve come to the right place. What exactly is a watercolor bundle? The watercolor graphics package deal can be described as a package containing pictures and drawings painted with watercolors. They will properly come in handy for a range of companies, like perfume, food distributors and fashion. Wedding stationery or cards may be made using this kind of package deal. 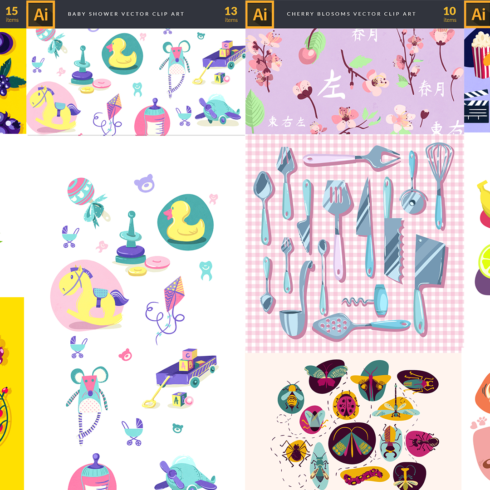 MasterBundles is a marketplace that accumulates top rated offers from over the web and lets you buy the design components you’ll need in your design business for a cheaper price .. Bundle deals this fabulous website offers are restricted in time, and that’s the answer why they are so inexpensive. To avoid missing the deal you’re going to be definitely excited about – join for the email newsletter, revealing the most recent offers. MasterBundles also has a big blog with the helpful design features explained.